An exclusive interview with Mowlavi Abdul Hamid, a senior Iranian Sunni cleric. The nightmare is finally over. The Iranian border guards taken hostage in Iran’s Sistan and Baluchistan region have finally been released, even though one of the five border guards, Jamshid Danaeifar, was unfortunately martyred in the first days of the Persian New Year. Jaish-ul-adl, the terrorist group claiming responsibility for taking the soldiers hostage, apparently had a long list of demands in return for the release of the hostages. After weeks of campaigns by Iranians around the world on social networks and the widespread efforts of the Iranian government, which also asked the elders of the Sistan and Baluchistan province to mediate, the Iranian border guards finally returned to Iran on Sunday through the Afghan border. 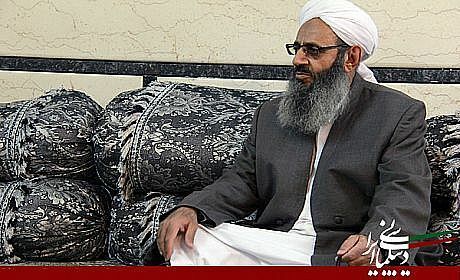 One of the influential individuals responsible for mediating with Jaish-ul-adl was Mowlavi Abdul Hamid, the city of Zahedan’s Sunni Friday Prayer leader, with whom Iranian Diplomacy recently sat down for an interview. What measures did you take for the freedom of the border guards when they were taken hostage? I must first reiterate that hostage-taking, in my opinion, is a very deplorable act and taking any human as a hostage is very inhumane, especially when there are border guards involved who defend the borders of our country and make efforts to provide the security of the people. Every individual feels responsible about this issue and, when these border guards were taken hostage, we felt the heavy burden of our national and religious responsibility to take measures for their freedom. Furthermore, the officials of the province also asked me to begin attempts to free them. First, we dispatched a delegation comprised of certain elders who were respected and trustworthy to negotiate with the Jaish-ul-Adl. It became obvious that this group had numerous demands with regard to the release of their prisoners, etc. I sent a Holy Quran along with this delegation and asked this group to free the border guards out of respect for the people of Iran. Our dispatched delegation was quickly able to gain the agreement of this group for the release of the border guards but the reason for the delay in its enforcement was that other groups had also begun their attempts to free these border guards and had proposed financial offers which led to the delay of their freedom. Unfortunately, one of the border guards was martyred but the remaining four were liberated. Prior to the martyrdom of Mr. Danaeifar, had you already begun serious attempts to mediate or was it after this incident that the efforts were accelerated? Yes, we had started our efforts before his martyrdom but this group had claimed that they would kill one of the five soldiers in retaliation for the killing of a prisoner who they said was killed in the suburbs of Kermanshah by the government. Of course, our delegation had managed to gain their agreement to not kill Mr. Danaeifar but there were certain differences between the members of the council that made decisions for this group. Ultimately, internal differences in Jaish-ul-Adl, and apparently the entrance of some other groups for the freedom of these border guards, somehow led to the execution of Mr. Danaeifar. We saw in different interviews by this group that they had admitted their differences with regard to the execution of Mr. Danaeifar. This means that other individuals besides those who had promised to deliver all of these border guards safe and sound were involved in his execution. Who are the other groups that attempted to free these border guards? Apparently, certain groups from some Iranian institutions were also dispatched for the freedom of these border guards. Of course, our delegation had reiterated from the beginning that we would neither pay a ransom nor fulfill their demands, and that we only ask them to free these soldiers out of respect for the people. So none of their numerous demands were ultimately fulfilled? You said that the Governor’s office of Sistan and Baluchistan province had asked you to mediate for the freedom of these border guards. Were there any contacts from Tehran? No. Nonetheless, the Governor’s office pursued this matter here and we began our efforts in collaboration with this office. What is your opinion about the activities of Jaish-ul-Adl? Do you approve of their behavior? I strongly oppose violence and terror and believe that all problems must be solved through dialogue. We have, many times, reiterated that violence leads to more violence and the best solution is dialogue. Dialogue is the only way to achieve the ignored rights of anyone who claims as such. I assume that all Iranians accept this issue and there is no Iranian who does not accept the Constitution. Even many of the criticizing movements believe that Iran’s constitution is useful and can be referred to. Therefore, those who believe in Iran’s constitution and the Islamic Republic of Iran can pursue their demands through dialogue. Of course these groups criticize us and state that you have not, hitherto, been able to reach your desired results but, nonetheless, I believe that at the end of the day it is through dialogue that problems will be resolved. I have, several times, reiterated that the new administration pursues the logic of dialogue and proper grounds are prepared for the resolution of differences through dialogue. Do you intend to use your status among the Sunnis to temporarily contain groups such as Jaish-ul-Adl which resort to violence every now and then? The problem is that there is no guarantee today that a similar incident would not take place within a month. Yes, it is true and that is the difference that exists. Before this incident, I had dispatched one individual to talk with this group and I had asked them to refrain from resorting to violence in order to reach their goals. I had also emphasized that if they sought security for some of their members, we would facilitate this matter and the related officials were also ready to cooperate with us. I had reiterated that a suitable atmosphere was created in Iran for the participation of different ethnicities and religions and that we could begin negotiations right then. We had these talks with this group and our delegation had sent the same message this time as well. I stated that the atmosphere for talks which did not even exist before was now prepared for the opposition and that the new administration believes in opening a dialogue with the US and, on this basis, one could hope for the improvement of the situation. Of course I am not disappointed yet with regard to the impact of our talks with Jaish-ul-Adl. Do you believe that some foreign countries support this group? The fact is that this group was not supported until a short time ago and, based on our information, they were even faced with financial difficulties. But after the differences that were created in Syria and Iraq, this group has found financial supporters who help them in this regard. Do you mean foreign financial supporters? Is there any certain country which supports them? I do not know exactly which countries support them but I know that certain Arab states have established contacts with them. Do you believe that Iran-Pakistan cooperation could lead to the containment of Jaish-ul-Adl? Couldn’t Pakistan play a more positive role in this regard? No. I do not believe so. Neither Afghanistan nor Pakistan has the capability to play this role. Pakistan’s Baluchistan region covers 45% of this country’s land and, besides the fact that some parts of this region are difficult to cross over, there is the problem that the Baluchis of Pakistan demand their separation from Islamabad and pursue separatist activities. Pakistan is not able to control such a large region. The dispute between the Shiites and the Sunnis has continued inside the Middle East region, from Pakistan to Iraq, from Syria to Bahrain. How would you, as a scholar who has a special position among the Sunnis, consider Iran’s role in the containment of these disputes? Yes. We also feel these problems and the sufferings caused by these disputes. I talked about these issues in a conference which was held in the Holy Mecca about human rights and Islam. At the end of this conference, the “dialogue of unity” was proposed and I made a speech in this regard. Experts were invited from 70 countries. The issue of concern for all the participants was the unity of Muslims and the opening of dialogue between the Shiites and Sunnis and that the problems of the region must be resolved by the Muslims. As long as the Muslims are not united, there is no possibility of the resolution of these differences. I believe that the only solution is that the thinkers of the world of Islam must gather and bring the Shiite and Sunni groups who are in dispute with each other in Syria and Iraq to the negotiating table. I reiterated in that conference that the Shiites and the Sunnis of the world must use the existing capacities in Iran to contain the dispute between the Shiites and the Sunnis. Unfortunately, this narrow-mindedness exists in our own country as well. There are many who question the well-intended attempts and believe that perhaps we pursue our personal objectives in this matter, but the fact is that we only seek the unity of Muslims in the world of Islam. It is regretful that right now the Islamic states are not able to sit alongside each other and discuss the issues. If there was support for our efforts, we could take steps towards relative closeness between the Shiites and the Sunnis. We have solutions for the problems in Iraq as well and the Syrian crisis can also be resolved. At the end, it is the people of Syria who should sit around a table and resolve their problems. For example, I believe that the conflicts in Iraq were, in the beginning, about the rights of all groups but it ultimately took the form of religious disputes. This is while if Mr. Maleki had considered the rights of the Sunnis, these conflicts would not have happened. Right now, the door of dialogue between the Shiites and the Sunnis has been opened and the point is that the existing deadlock has necessitated the issue of dialogue. Saudi Arabia plays a more active role in strengthening the Takfiri groups in the region. Do you believe that the Saudi government is ready to stop its support and join the dialogue between the Islamic sects? Yes. Right now that there are these differences, Saudi Arabia plays a role in supporting them. Part of this dispute is supported by the supporters of Bashar Assad and another part by Saudi Arabia. Nonetheless, I believe that the government of Saudi Arabia could be convinced to take steps in ending these problems. The Islamic Republic of Iran currently enjoys a special status and Saudi Arabia also has a special status in the Arab world due to the placement of the holy shrines in this country. Therefore, their status could be used to end these disputes. Of course, Turkey also plays a significant role and these three countries could manage the problems. Would you agree with the analysis that the US makes the most of the conflicts among the Muslims and has not made any efforts to contain them? The western countries not only take advantage of this dispute but also take steps in strengthening them. The fact is that these countries are able to resolve this matter but do not take any measures in this regard. I reiterated in that conference that the US, Russia, and Europe first pursue their own interests in the world of Islam and then provide the interests of Israel and maybe in the end think about the interests of the world of Islam. The US cannot solve the problems in Syria and Iraq because the western countries might benefit from this crisis. It is now said that the terrorist Takfiri groups in Iraq and Syria are active and I also believe that this is true, but if the people of Syria and Iraq open dialogue among themselves, these terrorist groups will have no choice but to leave these countries.